Has it been 10 years already?!?! The Glux Blog’s first ever blog entry was on December 18, 2008 and was comprised of two sentences and a photo about the Perfect Snowman I had built. All of the original entries are still here on the blog if you want to go wayyy back in time. But I thought it might be fun to highlight how this blog has changed through the years and share some snapshots from years past and review some of the TOP Glux Blog articles of all time! I captured some snapshots using the interweb’s wayback machine (web.archive.org) and superimposed the old header that I used to use at the top to reenact the original Shaolin Town Blog for you guys! When I first created this blog, it was intended to be a news post for my Animal Crossing gamer friends to know when my town (Shaolin) had good turnip prices, special items on sale, etc. Why I did this on a blog instead of Twitter is still unknown to this day lol! CONSPIRACY tags! If you click on the word “conspiracy” in the tag cloud, you will see (in reverse order, so start from the bottom) all of the blogs I wrote in regards to the drama between Mabel, Sable, Labelle, GracieGrace and Tom Nook. 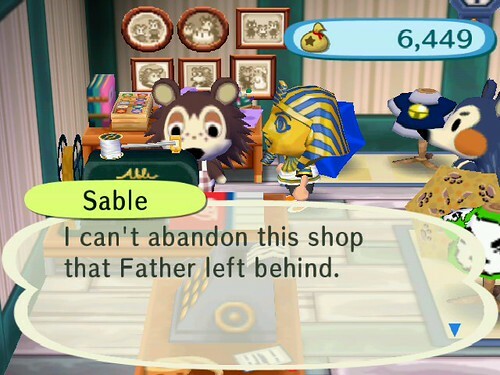 In City Folk, Labelle was a new character, and it was cool to watch the backstory unfold between these otherwise always happy NPC’s. I hope one day that a future Animal Crossing game will return to this dramatic storyline and tie up the loose ends and unanswered questions that still remain. Game Guides! Maybe back in 2009 there weren’t a lot of online resources available for AC:CF. This led me to create a couple of how-to guides to help my fellow gamers have a better experience. I wrote an AC:CF Cloning Guide so that players on ANY bell budget could have a Royal Crown in their inventory. Then there was the ‘all my grass is gone’ controversy where I literally did a science experiment in the game to determine how to grow grass back in our towns that were overrun with dirt. I wrote up the AC:CF Grass Guide to help with the springtime regrowth process. Does that make me an Animal Crossing Botanist? The Giant Petaltail! 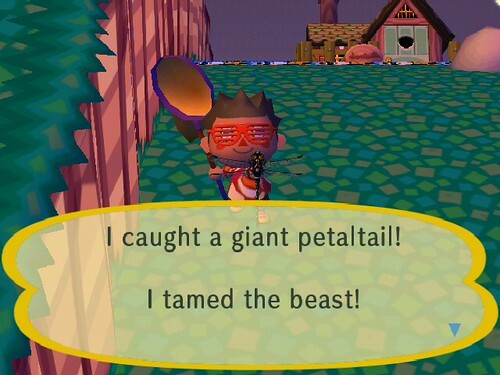 One of the most annoying and hard to catch insects in all of Animal Crossing: City Folk was the Giant Petaltail dragonfly. This thing was so hard to even spot, let alone catch, and I went to extreme measures to complete my bug encyclopedia by chopping down all the trees in my town. (Kind of like the Britney Spears head-shaving meltdown.) After I wrote this blog article about catching the Giant Petaltail, my blog views rate EXPLODED! To this day, this particular entry ranks as the #3 top viewed page of all time on my blog insights. Let’s fast forward a bit. The year is now 2011! The blog is still called the Shaolin Town Blog, and I’m still playing the game, but mostly just to log in and pick up DLC items that were being released. Pokedex Completion! It wasn’t until 2012 when I finally accomplished this feat, but it was an epic project at the time and I was really proud that I was able to catch ’em all. 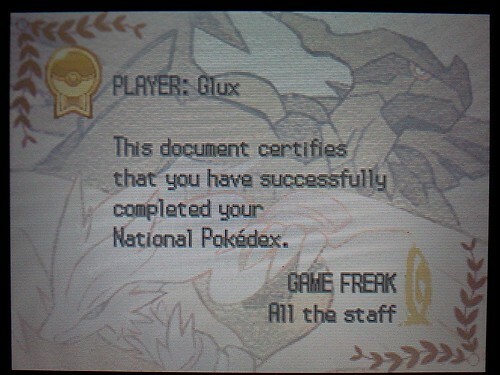 I wrote up a Pokedex Completion Guide for HG/SS, as well as an overview of the work that I put into this task in my updated National Pokedex Completion blog that was posted when I completed the ‘dex in Pokemon White (the following generation). These two blogs still rank in the top 10 of the most viewed pages on The Glux Blog, and I’m still proud of them! In fact, many of the Pokemon that are sitting in my Pokemon Bank boxes today are transferred up from these early gens! Event Arceus from Toys R Us: An especially throw-back topic I wrote about was the unique cut-scene experience in Pokemon HeartGold/SoulSilver when you bring a specific DLC Arceus from the now out of business Toys R Us (sadface) to a certain location in the game, and it unlocks not only the connection between the Sinnoh and Kanto regions, but also the freaking ORIGIN OF LIFE ITSELF. I tried my best to document the in-game event by taking photos with a camera (yep some high tech stuff going on here). I thought this was one of the coolest parts of HG/SS and I thought the amount of unlockable content via free DLC was incredible in this game! It wasn’t always fun and games on the Glux Blog. During the early Animal Crossing days, I faced a Wii system meltdown that threatened the safety of my AC:CF save file. That was dramatic at the time. In 2014, I had a problem with my Japanese AC:NL game that was tricky to figure out because I don’t speak Japanese. But in both tales, the game prevailed and my Animal Crossing towns survived! Huzzah! In the more recent years of my blog, I’ve continued to branch out in terms of topics covered. 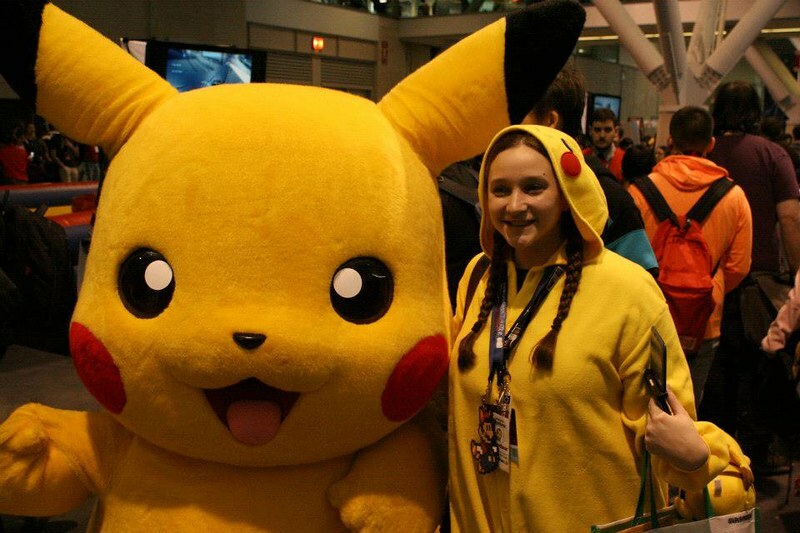 In 2013 I co-hosted my first gamer-related panel at PAX East, and while I was in my Pikachu kigurumi, Nintendo reps let me jump the line for a photo op! I was very excited to receive such special treatment. 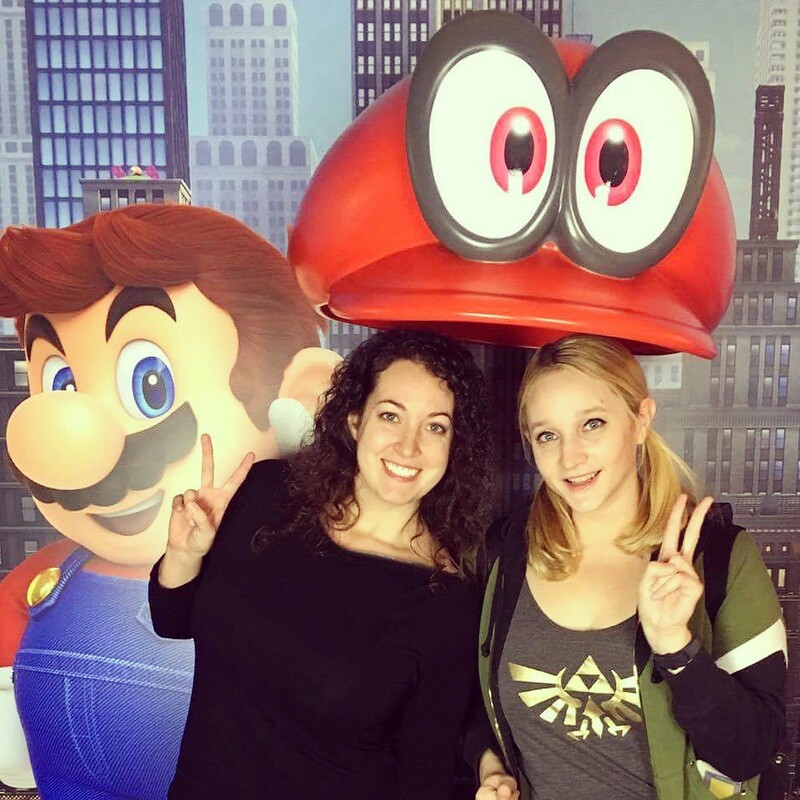 More recently in 2017, I documented a hands-on fan experience for the Nintendo Switch system, which was about to debut. Since then I’ve added even more topics to my rotation, such as Cosplay costumes, the (somewhat) monthly Book Reports and the ongoing Dungeons and Dragons saga. It’s been a lot of fun sharing my gamer fandom with all of you readers throughout the years. Thank you to everyone who has been reading my blog and subscribing since the early days! The Glux Blog has allowed me to connect with so many different people from all over the world and I really appreciate each and every one of you who I’ve shared gaming experiences with over the years. If you’re a longtime reader, please leave a shout out in the comments!! Let’s keep gaming together for many more years to come! HAPPY BLOGAVERSARY!!!!! Here’s to another 10 years of games and geekdom!